L513+, DF1+, Z249+, CTS5396+, S5892+, L193+, S5668+, S6365+ confirmed testers should join as well as matches of those people. The STR values of DYS406s1/DYF406s1>=11 and DYS617>=13 are a strong indication for R1b/R-M269 people. Almost everyone who fits the "11-13 Combo" STR signature is L513+. 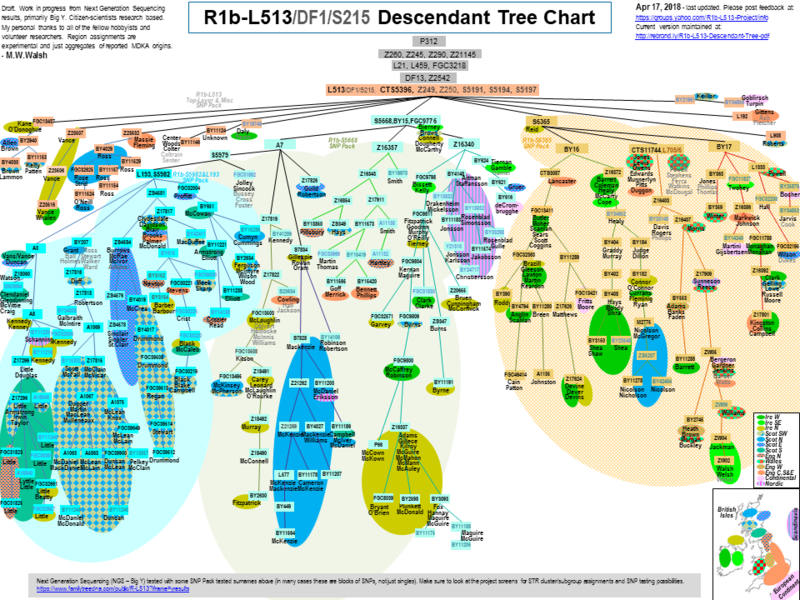 We are constructing a haplogroup tree with surnames, locations and timeframes in an effort to understand our origins, cultures, and relationships within our genealogies and back into the ancient past. The tree is growing but we need your participation to help discover the branches and compare histories. There are no membership fees and contact information is kept confidential. Please review the Results tab above or at https://www.familytreedna.com/groups/R-L513/about/results for the current Descendants and Haplotrees for L513 as well as links to detailed reports. Please join the R1b-L513 Facebook at https://www.facebook.com/groups/R1b.L513/ or Yahoo Group at http://groups.yahoo.com/groups/R1b-L513-Project/ or discussion, support and help . The project provides SNP testing considerations as a part of the subgrouping on the Y Classic pages under the DNA Results menu to the left. This is a public project so that our findings can be shared with and saved for our descendants and relatives. The more of us who test and share our information, the more we will all know. When you join this project, you have granted permission to display pseudonymized DNA results and entered project data, like Earliest Known Paternal Ancestor and Origins, publicly and that can never be fully retracted. However, administrators do not display personal contact information and full names publicly and attempt to faithfully follow FTDNA guidelines and regulations.